Florida is a bicycle-friendly state. Many cyclists take advantage of the warm temperatures and the beauty of the outdoors. 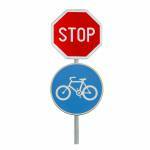 Sharing the road with bikers is something that automobile drivers often experience in Florida. A bike rider is encouraged to use the bike lane whenever available. However, if there is no bike lane, they are permitted to ride on the road, as far to the right as possible. Vehicles using the road must allow 3’ of space around the cyclist. This 3’ gives cyclists the space to ride and maneuver safely. If they need to swerve to avoid a pothole or debris in the road, they can pass other vehicles without injury. This is difficult to do on a busy or narrow street. A biker also has a different set of laws that pertain only to them. For instance, they may be able to ride through a red light or make a left turn in the right lane if necessary. Florida is a no-fault state. This means when there is an accident (of any kind) the vehicle driver must file a claim with their own insurance company to pay their medical expenses. Bicycles are considered vehicles in Florida, so cyclists must also file medical claims with their insurance company. What about the damages to the bike, automobile, and someone’s personal property if it was involved in the accident? It is crucial to prove who is at fault to avoid additional costs. In Florida, it is more common for both drivers to be found at fault. They often rule that the automobile was 80% at fault and the cyclist was 20% at fault. If either party wants to sue for their percentage, they should speak to an attorney first. No matter who is at fault, injury and damages are common after an accident. Your first responsibility is to see if you or anyone else is hurt. This includes bystanders. Call 911 and give them your location. Follow the instructions the 911 operator gives you and do not attempt to move anyone or anything. If you are hurt, try to remain calm. Apply pressure to any bleeding wounds. Stay still if you are in a safe place. 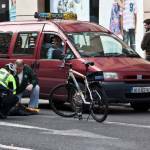 It is difficult to determine fault in an accident with a car and bike. Due to the size of the vehicles, the bike will probably be damaged beyond repair, and the rider may be seriously injured. Do not waste your time arguing with anyone regarding who’s at fault. Instead, use your cell phone to take pictures of the accident from every angle if possible. Get names and phone numbers of any witnesses. Take pictures of the road, the right side of the road and the shoulder. Also, any markings or debris that can be used to prove what happened at the time of the collision. Do not give any statements to anyone other than the police. Do not apologize to the other parties involved or admit to any fault. If there are serious injuries, or if someone dies due to the accident, a comment made to show comfort and concern can be twisted to look like an admission of guilt.